Chelsea didn’t just lose to Manchester City on Sunday, they got thrashed. To make matters worse, it wasn’t even that surprising. After going unbeaten in their first 12 Premier League matches (18 in all competitions), Chelsea have fallen all the way to sixth. Things are bad at Chelsea. They’ve lost three of their last five and haven’t scored in four of their last six Premier League matches. 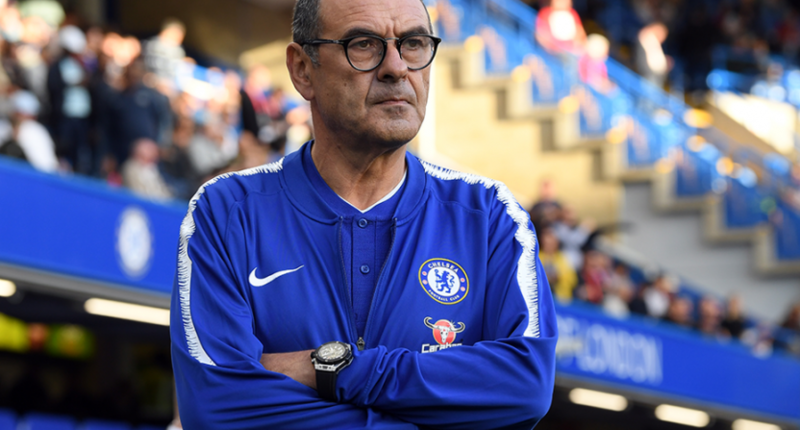 As what always happens at Chelsea, manager Maurizio Sarri has come under pressure, and the tension between him and the players is icy at best. A few weeks ago, Sarri said the Chelsea players were “difficult to motivate.” Sarri hasn’t been portrayed well in the media recently, and his tactics have come under increasing scrutiny. His decision to use Jorginho as a holding midfielder and push the world’s best holding midfield N’Golo Kante into an attacking position has been questionable at best, and Sarri’s tactics now appear to be under question from the players themselves. Chelsea players apparently “baffled by Sarri tactics”. Really ? They went 18 games unbeaten using them in the autumn. Is it him or them ? It’s not a stretch to say that Sarri is on the hot seat. Chelsea have a history of sacking managers quickly. Andre Villas-Boas was sacked in March in his first season. Roberto Di Matteo was sacked in November of his first full season. Jose Mourinho was sacked in December. The culture at Chelsea is toxic for a manager. They are faced with unrealistically high expectations of not only winning, but looking good doing it. Additionally, it’s a club where the players run the show, and the players know it. Villas-Boas, Di Matteo, and Mourinho were all sacked for the same reason. The players weren’t playing for them. It’s certainly easy to make the case that that’s what’s happening currently under Sarri. The players, specifically Eden Hazard, aren’t performing for him because they don’t like his tactics. That might be true, but what isn’t true would be to say that it’s this specific crop of Chelsea players who are the problem. When Villas-Boas was sacked in 2012, the only member of that team that’s still with Chelsea was David Luiz. Eden Hazard joined the following summer and along with Luiz are the two holdovers from the team Di Matteo was sacked from. Those squads had Chelsea stalwarts John Terry, Frank Lampard, Gary Cahill, Didier Drogba, and Ashley Cole. By the end of Mourinho’s tenure, Terry, Cahill, and Branislav Ivanovic were all still with the club, making him the fourth manager they had run out of town in four years. Those players are all gone, but their impact remains. They created a culture at Chelsea where the players always get what they want. If they don’t want the coach, they’ll get rid of him. Chelsea don’t build their teams from within. Everyone knows about their famed ‘loan army’ in the academy. But rarely does a player ever break free of the loans and crack the first team. The main purpose of Chelsea’s academy is to sell off players for profit while the first team builds by buying older, more established players in the transfer market. The result of that is always having a team that can compete at the top, but also be made up entirely of mercenaries. That’s where things become dangerous. None of the players at Chelsea grew up at Chelsea. Right now, Chelsea are considered a top European club, but when Roman Abramovich took over, they had won just one league title back in 1955. Chelsea weren’t a club that youngsters grew up dreaming of playing for. They didn’t have the history of Manchester United, Real Madrid, Juventus, or Liverpool. London doesn’t have the great weather that Barcelona can offer. If you were choosing to sign for Chelsea, you were doing it for one reason and one reason only, money. The players that Chelsea were signing were older and established. They had broken through and now were looking for their big payday. They don’t have Chelsea in their blood. Sure, they are competitive people and want to win. But when push comes to shove, they’re not loyal to Chelsea, they’re loyal to their paychecks. A Sarriball point. He immediately turned a Rafa Benitez led Napoli around. None of this it takes time to get the right players and implement a system stuff. Arguing that it *has* to take time to get implemented is wrong. The argument is about how/why Chelsea is diff than Napoli. So when these players don’t like the manager, they’re not afraid to walk away. They’ll get their paycheck somewhere else (hence why Alexis Sanchez had no problem leaving Arsenal). Isn’t it funny how Eden Hazard never seems to have a problem with his Belgium manager? Because he can’t go anywhere else! Chelsea aren’t the first club to have this problem. Before Pep Guardiola arrived at the Ethiad, Manchester City’s team of mercenaries struggled to maintain their form for back-to-back years. That’s what happens when you don’t care for the shirt. The solution isn’t necessarily to just promote from the academy. You can create that club loyalty simply by buying young. Dele Alli didn’t come through the Tottenham ranks and Wayne Rooney didn’t grow up at Manchester United. Both cared deeply for their clubs. Chelsea doesn’t even take chances on teenagers. Terry may have been the exception to the rule but he was brought in before Abramovich took over so he came in as a teenager in a way different time for The Blues. This year, Maurizio Sarri walked into an impossible situation. He wasn’t given a full preseason because Chelsea inexplicably didn’t fire Antonio Conte. He’s walking into a team where the culture is well established that the players get whatever they want. To make matters worse, Sarri has never won anything. He’s done really well at smaller clubs, but we’re talking about players two years removed from winning the Premier League. Managers who like to completely change a style at a big club is always a dicy situation. But now, a manager who hasn’t won anything is trying to tell these players with vast trophy cabinets how to play. If you’ve learned anything from Jose Mourinho, it’s that that doesn’t work. And if that doesn’t work for someone who has won lots of trophies as a manager, it won’t work for Sarri. At this point it won’t be surprising if Sarri sticks out the season. It also wouldn’t be surprising if he gets sacked in the next few weeks. Whatever the outcome, don’t call this Sarri’s mess. This is Chelsea’s mess. They created it, and now they have to live with it.